The photograph was inherited from an uncle who lived in Caernarfonshire serving in the railway police. From another photo he provided, of Special tank no. 3594, the date could be between June 1918 and August 1927, if it is the same engine. In 1926 no.3594 was allocated to Chester Shed. Can anyone help in identifying the location please? First thoughts - one of those exchange sidings between a narrow gauge railway and the L.N.W.R. in north west Wales, Caernarvonshire especially. Don't know where the photo is taken, but could it be close to the sea or a quarry. Looking through the cab cut-outs you can see a small house/building which appears to be on a cliff. Between the back of the cab and the wagon, not sure what it is, but enlarging the image would appear to show what look like houses. Behind the loco is a stone wall about 4ft 6in or even 5ft 0in high with what appears to be a mesh extension on metal poles to increase the height further. Why was this required - a football field on the other side of the wall?? The telegraph pole on the left is right by the wall. The houses in the background are much further away but on a rise as the doors may be seen. To the right of the houses appears to be a single-storey building with doors but no windows - a stable perhaps? The top of another (isolated?) building is visible through the cab cutaway above the wall. The dark ground surrounding it is land (a field), not water. 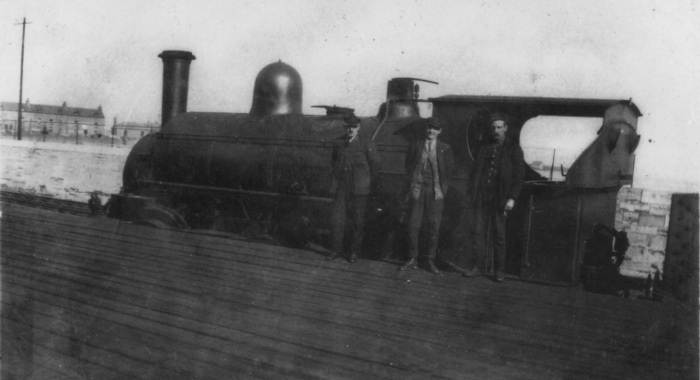 Assuming that the sun - which seems to be quite strong as the chaps are squinting and there are marked shadows - is in the south, the loco is pointing roughly north-west. If the sun is lower or later in the day, the loco is pointing roughly north. The Special Tank is fitted with the vacuum brake.